← Mercyful (Antique Tiles) Quilt Finished! 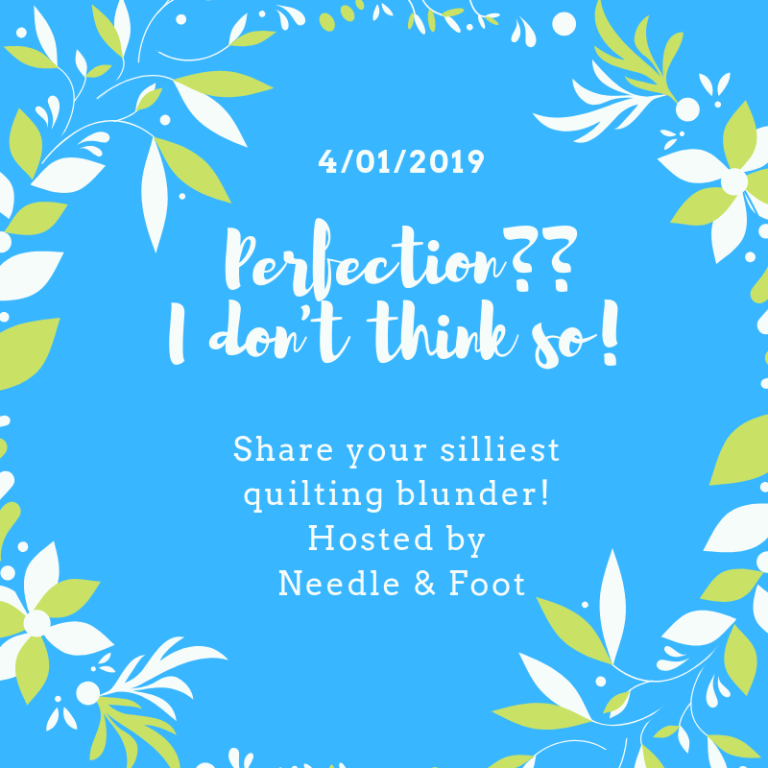 Bernie with Needle & Foot is hosting a great linky party/discussion about quilting blunders. I agree with Bernie that when looking at social media posts that show other people’s masterpieces, it can be so easy to compare ourselves with others and feel that our work is not skilled enough, prolific enough, intricate enough, etc. I, too, have made my fair share of quilting mishaps. Unfortunately I don’t have photographs of my goofs. Just this past weekend I was making some half-square triangles for a couple of bee blocks and decided to use Lee Heinrich’s paper-pieced Perfect HSTs that don’t require any trimming. Well, they would have been perfect if I had used the right size! I used 2.5” finished instead of 2” finished, so after ripping off the paper, I got to spend some extra time trimming down my HSTs! I’ve learned the most important thing to do after discovering a mistake is to say “oh well” (or some other expression if necessary!) and then to focus my energy on fixing the problem rather than beating myself up for the mistake. I’ve been quilting for over four years, and I use my seam ripper on a frequent basis. At first I didn’t understand why many quilters would talk about “unpicking” their seams. But that’s exactly what I do at some point with all of my major projects if I’ve veered off at the end of a seam, have a flipped seam allowance, or haven’t matched a point to my “good enough” standard. I’ve seen videos on ripping seams really fast with seam rippers, and I tried that once, and not only ripped my seam but also ripped my fabric! I really could go on and on about all my quilting snafus, but I’ve found that a little time and distance goes a long ways to being okay with my mistakes and sometimes even embracing them. My favorite all time project is my Summer Sampler 2017 quilt, and when I discovered that there was some color variation in my Kona Coal background fabric, I was NOT happy and was upset with myself for not buying all of the background fabric at one time because I had heard that there can be color variations in dye lots, which I can attest is true! And there are several less-than-perfect paper-pieced center joins where many points meet, and I just don’t care. I love this quilt, and it still makes me feel happy when I look at it. If there are any new quilters reading this post, my advice is to use social media for inspiration and to help you really figure out what you’re drawn to and where you want to focus your energies. But be kind to yourself and don’t expect to be perfect. It truly is more about the journey than the destination! It really is about the journey, Mary, what a wonderful way to put it. I also like to remind myself that no matter what, in the end I get a quilt. And a finished quilt is a glorious thing!